In “The Sinner’s Prayer: Its Origins and Dangers” David Malcolm Bennett uncovers some surprising material on some of the world’s most famous evangelists in his quest to uncover the origin of “the sinner’s prayer”. Does the sinner’s prayer match up with biblical practices and teaching? 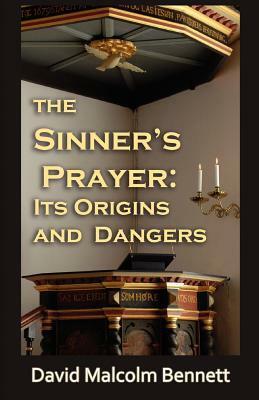 In what sense is the Sinner’s Prayer dangerous? Can you be saved without saying the sinner’s prayer? What part did Charles Finney, D. L. Moody, William Booth and Billy Graham play in its development? “An excellent piece of research”, Dave Bennett (a British evangelist – not a relative of the author). “An excellent and well laid-out study”, Bob Lay (a church historian). Mark Noll, a church historian/theologian, has called David’s work on the Altar Call, “good writing based on very good research”. Michael Haykin, a church historian, has dubbed David’s book The Altar Call “the definitive” work on the subject. Mike Farrow of The Salvation Army called the first volume of David’s The General: William Booth “very readable” and “well researched”. The General has also been called “excellent” by John Read of The Salvation Army and “superb” in a UK Salvation Army book catalogue. Rich Deem of godandscience.org has called David “an excellent writer”. Don Prout described David’s book on Moody and Sankey as being “excellent” and “easy to read”. Irene Oliver of the Queensland Baptist has said that with his book on Moody and Sankey David “has mastered the art of the historical biography”. David’s The End of the World is Near! Or is it? has been called “an excellent introduction to the whole subject of the end times”, David Schulz in Evangelical Action.